About a year and a half ago, my husband and I were in a spending rut. We always bought just a little too much and always bought it whenever we wanted it. Go out for ice cream? Sure! New sweater? Sure! We didn’t have any idea what it was like to have to wait for anything. In today’s consumer culture, instant gratification is the name of the game. It’s a treat-yo-self lifestyle in a world that is constantly pummeled with advertisements that reinforce that we need the best and we need it now. Why would big companies do such a thing? Well, there is this thing called your hard earned money and they want it. What if you had the dedication and accountability to not only save that money in your pocket but also bring less into your home? Keep on reading for a FREE 72 Hour List Printable! Like I’ve said before in regards to secondhand shopping and to meal planning, make a list and stick to it! You know what you want and what you need so write it down. Having a visual aid of what you need to purchase reinforces how you spend your money and how much of it you spend. With a list you are less likely to deviate from it and purchase items you don’t need. You’re also less likely to forget something at the store! Think of all the money you could save if you didn’t purchase that extra bag of chips and jar of salsa or that random shirt of the clearance rack. Think of what would save if you took a list shopping every time you went to the store – not just for groceries. Online shopping, secondhand shopping, clothes shopping, back to school shopping… You get the idea. 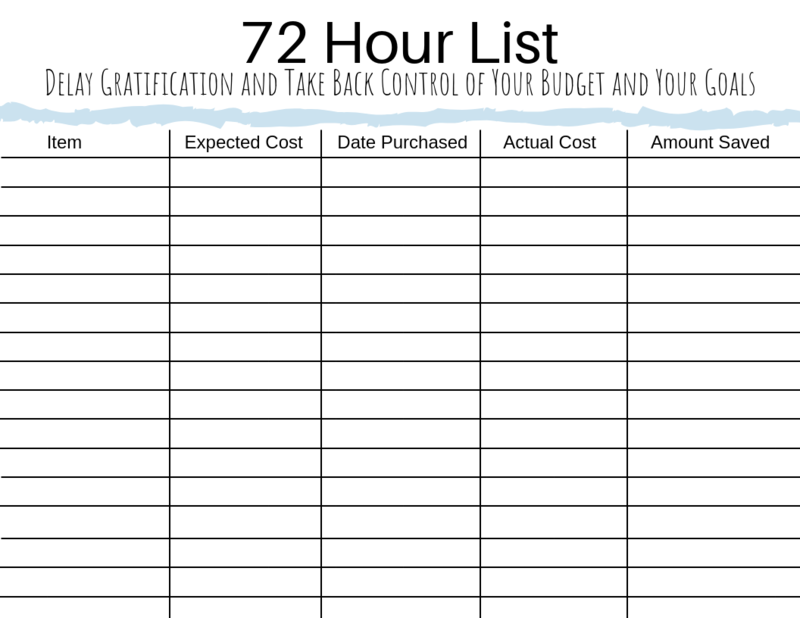 What’s so different about this “72 Hour List” versus a regular shopping list? The biggest difference is that the 72 Hour List is only used for our wants and we wait three days (72 hours) before making that purchase. That means that it excludes groceries, baby care items, and other necessities. On this list, which we have saved as a Google Doc, we put big ticket items that are truly wants (concert tickets, season passes to theme parks, new couch, etc) but could be purchased in the distant future. Truly items that can wait three or more days. Smaller items are also listed. This includes items like a small fire-proof safe, pinking shears, and a cake carrier (it’s a strange assortment of things). Seriously, any item that isn’t necessary for survival (food, water, transportation, baby care, etc) or isn’t premeditated (like back to school shopping – you know it comes in August every year) can go on this 72 Hour List. The biggest savings that have come from having this list is $2,200. That’s right. We would have dropped TWO GRAND on something if we didn’t have this list. What was it? Season passes for two to the Performing Arts Center with awesome seats. Below is the image of our 72 Hour List. We have different columns for what the item is, the expected cost, date purchased, actual cost, and money saved. We strike through once we’ve waited the 72 hours and have decided not to purchase it. Items that we have yet to purchase but still want we leave on the list until 1) we find it on a super sale or 2) we find it secondhand. Waiting 72 hours and delaying that instant gratification that the consumer world urges us to have also prevents clutter from building up in our home. We don’t buy items we don’t truly need (or want after a couple of days) so we don’t have to find space for them. With less clutter, you can focus on having a non-consumerist and minimal lifestyle. As promised for you my wonderful readers, is a free printable to help you take control of the instant gratification that might be taking hold of your budget or your minimalism goals. Enjoy and print as many copies as you would like! If you LOVE it, subscribe to my email list and stay up to date with us (you’ll get Meal Planning 101 absolutely free for doing so!). This is all so true. It really does help to wait and make sure you really want it. So easy to just ‘buy’. Great idea to put a time on it! Having a timeline for those wants rather than needs makes all the difference! Such an excellent idea! I think I even do this by putting things down on the grocery list and then not picking them up b/c we don’t need them right away. That’s super! I’ve been trying to get two grocery lists going: one for immediate needs and one for things we are almost out of. We’ll see how this works!